In my past life, before I found my life’s calling of helping people with thyroid conditions take back their health as the “Thyroid Pharmacist”, I worked as a consultant pharmacist who was focused on optimizing medications for people with disabilities and the elderly. While my official job title was Consultant Pharmacist, I really felt that the most important part of my job was to help advocate for individuals who could not voice their health concerns. I ensured that they were getting the most benefit from their medications, that they were not over-medicated, that they had access to medications that could potentially help them, and that they received the proper care they deserved. I want to do the same for you. There are quite a few options for thyroid medications for hypothyroidism. However, most people are only familiar with synthetic T4-containing thyroid medications. Some people report feeling better on combination T4/T3 medications (like Armour®, compounded T4/T3 or Nature-Throid®). Others may feel better taking synthetic T4 medications (like Synthroid®, Tirosint® or Levoxyl®), while some patients may benefit from a synthetic T3 medication (like Cytomel®). Still, others feel best when on T4-containing medications made without fillers that they are sensitive to. Of the readers I’ve surveyed, up to 59 percent have felt better taking a combination T4/T3 medication, while up to 43 percent have felt better on a synthetic T4 medication. While lab results seem to be most improved with Synthroid® (69 percent), mood and overall energy seem to improve more by switching to a combination medication like Nature-Throid® (63 percent). Changing your thyroid medication may help you absorb thyroid hormone better, which may in turn result in a reduction in symptoms, and an increase in mood and energy levels! Is levothyroxine beneficial for everyone? What are compounded T4/T3 medications? The standard of care for Hashimoto’s is to utilize a synthetic thyroid hormone replacement medication. Levothyroxine, commonly sold as Synthroid® or under other brand names like Levoxyl®, Tirosint®, Euthyrox® (in the EU), Eltroxin® (in Canada), and Oroxine® or Eutroxsig® (in Australia), is a man-made T4 hormone. It’s the most commonly prescribed medication for Hashimoto’s once a person progresses into the advanced hypothyroid stage, and it is used as replacement or supplemental therapy for internally produced thyroid hormones when our own thyroid gland cannot make enough. Many people do very well on T4-containing medications once they are dosed appropriately and stabilized. However, while these medications can be helpful for many people and their symptoms, levothyroxine does not address the underlying root causes of the condition. Synthetic thyroid medications are also often dosed incorrectly by doctors, taken incorrectly by patients, and underutilized by our bodies. This is because levothyroxine contains the less-active but longer-acting T4 hormone. The T4 molecule is considered a pro-hormone, as it is less physiologically active than T3 and needs to be converted to T3, the more active thyroid hormone, by our bodies. T3 is sometimes called our “go” hormone because it tells our body to boost metabolism, grow hair, and create more energy. 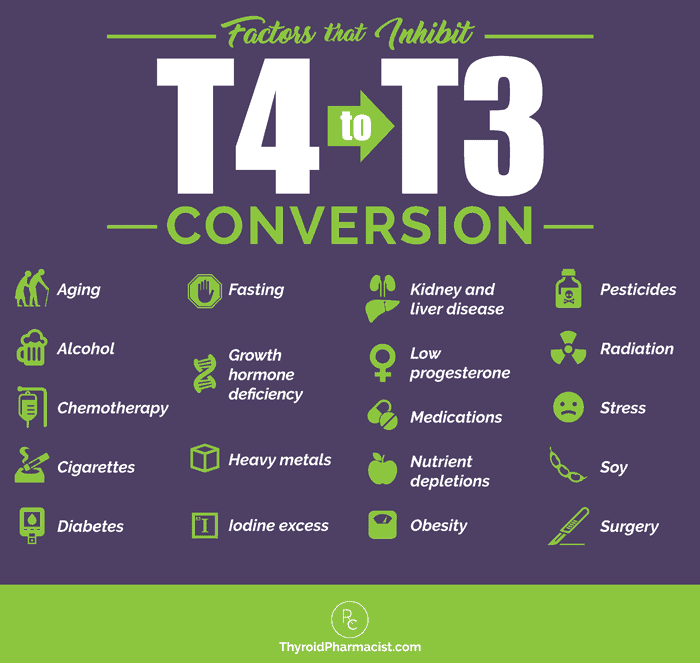 The conversion from T4 to T3 can be impeded by numerous factors, including stress, nutrient deficiencies, and impaired liver and gut activity. However, not everyone converts the T4 hormone to T3 properly. This is why many people continue to struggle with thyroid symptoms such as hair loss, brain fog, weight gain, depression and fatigue, even after they’ve started taking medication. As I mention in my books Hashimoto’s: The Root Cause and Hashimoto’s Protocol, as well as on my blog, dairy, corn, and gluten are some of the most common food sensitivities in those with Hashimoto’s; and ingesting even small portions of them can exacerbate symptoms and prevent healing in some. Removing these food sensitivities may, however, reverse the autoimmune attack on the thyroid in some cases! You may wish to ask your doctor about Tirosint®, which is a hypoallergenic T4-only option for those with multiple intolerances. Of the readers I have surveyed, those that switched to Tirosint® experienced a 68 percent improvement in labs, 50 percent improvement in mood, 62 percent improvement in energy levels, and 32 percent improvement in hair loss. These medications are generally not recommended to be used as a sole therapy for hypothyroidism, as their short half-life may put a person on a thyroid hormone roller coaster. However, they can be used as an add-on to T4-only medications. T4/T3 combination medications offer the two main thyroid hormones in the same ratio that is present in our own bodies. In 2014, Dr. Wilmar Wiersinga, a Dutch endocrinologist and top thyroid researcher, stated that: “Impaired psychological well-being, depression or anxiety are observed in 5-10% of hypothyroid patients receiving levothyroxine, despite normal TSH levels. Such complaints might hypothetically be related to increased free T4 and decreased free T3 serum concentrations, which result in the abnormally low free T4/free T3 ratios observed in 30% of patients on levothyroxine. Evidence is mounting that levothyroxine (T4) monotherapy cannot assure a euthyroid state in all tissues simultaneously, and that normal serum TSH levels in patients receiving levothyroxine reflect pituitary euthyroidism alone.” In other words, this study suggested that T4-only therapy might not be enough to address the symptoms of hypothyroid patients, especially those related to mental well-being. Dr. Wiersinga suggests that people with specific genetic polymorphisms (certain gene mutations) that affect thyroid hormone transport may benefit from combination T4/T3 therapy, and that people who continue to have thyroid symptoms despite having normal TSH levels may benefit from a trial of T3 in addition to T4 medication. Further studies are needed to answer the questions of whether or not T4 alone is sufficient. To date, studies have been inconclusive, yet the number of hypothyroid patients asking for T4/T3 combination therapy has multiplied in the last decade. Interestingly, a new follow up to the 2014 Dr. Wiersinga study, published in 2017, claims that T3 therapy has still not been proven to be beneficial, but many patients are now asking their doctors to switch them to T4/T3 combination medications, as many have reported a reduction in their thyroid symptoms when T3 is added to their regimen. Physicians may worry about using T3-containing medications or increasing the doses of thyroid medications due to concerns about heart palpitations and increased risks of osteoporosis, which may result from a person who has excess levels of thyroid hormones. Weight loss clinics started prescribing Cytomel® along with amphetamines and liquid diets for people without thyroid disease. As you can imagine, this combination given to an overweight person with a normally functioning thyroid often created a dangerous situation. Patients were admitted into emergency rooms with life threatening symptoms of high fever, palpitations, labored breathing, dehydration, delirium, nausea, vomiting and even coma. This can be a very difficult clinical situation to manage, and death can result. People exposed to this cocktail were at risk for future problems of thyroid management (alternating hyperthyroid and hypothyroid states), cardiac damage, and severe depression. Of course, as a pharmacist, I would like to point out that using thyroid medications to induce weight loss for people without thyroid disease is completely inappropriate. Doctors were essentially inducing hyperthyroidism in people to induce weight loss. Since that time, the FDA has placed a “black box warning” (the strictest warning that can be placed in the labeling of prescription drugs when there is reasonable evidence of serious risks associated with the drug) on all thyroid medications, noting that they should not be used for obesity and weight loss in people with normal thyroid function, and that higher doses may cause life-threatening toxicity, especially when given with sympathomimetic medications. Many of today’s practicing endocrinologists witnessed the effects of T3 for weight loss induction first hand as young residents and medical students early in their training. One can certainly understand a doctor’s aversion to T3 or T4/T3 combinations because of its history of inappropriate use in the past. Most doctors truly care about your safety and want to do the best by their patients. However, in their effort to reduce the potential adverse reactions due to overtreatment, many individuals continue to experience thyroid symptoms because of undertreatment. Still, it’s important to understand why T3-containing medications can be beneficial to some patients. Understanding thyroid physiology, I do believe that combination products may be advantageous for many patients with Hashimoto’s, as some Hashimoto’s patients are not able to properly and efficiently convert T4 to T3. This could be due to a congested liver or a deficiency in zinc, which is required to convert T4 to T3. Hashimoto’s patients are often deficient in zinc, and you can read more about that here. Stress is another common cause of low T4 to T3 conversion. Under stressful situations, T4 gets converted to reverse T3 instead of T3. Reverse T3 is an inactive molecule related to T3, but without any physiological activity. (It essentially just takes up space!) In the case where a lot of reverse T3 is produced, adding a combination product that contains T3 will help ensure that the right hormone is getting to the right receptors. One T4/T3 medication option is Natural Desiccated Thyroid (NDT, sometimes called desiccated thyroid extract, or DTE) hormones. These medications are derived from the thyroid glands of pigs and are considered bio-identical to the hormones produced by our thyroid glands. When surveying my readers, I discovered that 59 percent did feel better after switching to Armour®, 57 percent felt better on Nature-Throid®, and 32 percent reported improvement with WP Thyroid®. Conventional treatment guidelines state that there is no benefit from taking combination T3/T4 products and that T4 products are superior. However, most of these claims are based on studies funded by pharmaceutical companies with a vested interest in promoting the use of their products. When NDT hormones were first isolated from the thyroid glands of animals, manufacturers would measure how active the hormones were by measuring the iodine content within the substance. Of course, iodine levels would vary from animal to animal, so this proved to be an inaccurate way of measuring hormone levels. It was later discovered that different batches of NDT would have varying levels of thyroid hormones. In the past two decades, however, the technology used for manufacturing NDT has much improved. Manufacturers of natural desiccated thyroid now utilize specific kinds of chemical tests to identify the exact amounts of thyroid hormones in their product, ensuring an accurate and consistent dose. Now, it seems, you can actually trust the dosage of T4 and T3 in NDT, whereas 30 years ago, that wasn’t the case. Doctors who have been in practice for quite some time and are not integrative-minded, might still be resistant to the use of NDT, as they remember the problems associated with the inconsistent product in its early years. A doctor who is familiar with clinical trials that have shown T3 and NDT can be safe and effective when used appropriately, is more likely to feel comfortable with prescribing these medications. However, your doctor may not be aware of this research, and sometimes, it may help for you to make them aware of the latest news in thyroid care. Some proponents of natural thyroid medications, including Dr. Alan Christianson (author of Healing Hashimoto’s), advise that the desiccated glands of animals may be the best option as they also have trace amounts of T1 and T2, which may have undiscovered biological functions. In contrast, Dr. Alexander Haskell (author of Hope for Hashimoto’s) and Dr. Mark Starr (author of Hypothyroidism Type II), report that for some patients, natural thyroid formulations from animal thyroids, such as Armour®, may perpetuate the autoimmune attack due to them containing thyroglobulin and thyroid peroxidase, and they only recommend compounded and synthetic thyroid medications for people with Hashimoto’s. Nonetheless, some people report that desiccated thyroid products, especially when given at a suppressive level, will reduce thyroid antibodies. A suppressive dose essentially puts our own thyroid to sleep, and all of the required hormones are obtained from the medication. That said, some patients may have ethical objections to using animal-derived natural desiccated products. If NDT medications do not seem like a good fit for you, compounded T4/T3 products offer another alternative. These medications also offer the advantage of being made devoid of any fillers that people may not tolerate, such as lactose or gluten, which are present in some thyroid medications and can be problematic for thyroid patients. Furthermore, these medications do not increase autoimmunity. However, compounded T4/T3 products need to be prepared by specially trained compounding pharmacists. These compounds are usually much more expensive and may need to be refrigerated to preserve activity. Thyroid compounds are usually prepared in the same physiological ratio that is found in NDT products. However, physicians can elect to change the amount of T3 and T4, as the compounding pharmacists must make the medications from scratch. This can be a huge advantage for patients who did not feel well on conventional treatments or natural desiccated thyroid treatments. I’ve seen quite a few instances where people with optimal TSH levels (between 1 to 3 μIU/mL) started suspended release or slow release compounded thyroid hormones and, all of a sudden, their TSH jumped to 8, 10 or even 20 μIU/mL! This is why many people with Hashimoto’s avoid sustained release formulations like Methocel, and instead opt for Avicel, the immediate release formulation that is better absorbed by their body. If you’re considering trying T4/T3 medications, please note that specially trained compounding pharmacists are needed to make T4/T3 compounds, and they do take some time to prepare. Additionally, not all compounding pharmacies are equal, and a specialized process is required to prepare an accurate dose of compounded thyroid medications. Thus, patients might have to travel out of their way to find a compounding pharmacy. As a Thyroid Pharmacist, I’ve organized a directory of Recommended Compounding Pharmacies to help you discover local compounding pharmacies near you. What is the source of the materials? Is the compound slow release or immediate release? The bottom line is that there are many options for thyroid hormone treatment, and you should work with your healthcare provider to find the one that works best for you. Please note, sometimes medications may go on backorder. If this happens to you, here are some resources to find out what’s in stock. You can try any of the mail-order pharmacies listed on their website; they should have available strengths stocked: Get Real About Hypothyroidism: Find a Pharmacy. Thyroid hormone therapy should be individualized with the patient in mind. You should work with an open-minded physician to find the thyroid medication that works best for you. You may find that, depending on your body and the type of medication you use, you may need to go higher or lower on the medication depending on how your body reacts to it. The key is not just to switch and move on with your life. Once you switch your thyroid medications, you need to retest in four to six weeks to see where your levels are and to see if you need to adjust your dosage any further. I always advise testing thyroid antibodies before and after starting new thyroid medications. For example, if someone starts feeling worse after initially feeling better on NDT or has an increase in thyroid peroxidase antibodies after starting NDT, switching to a compounded T4/T3 medication may be helpful. Ready to start? Download my eBook, Optimizing Thyroid Medications, free for a limited time. It contains key information, strategies and resources to help you get the most out of your thyroid medication, including a chart to help you convert your thyroid medication doses if you’re switching medications. When you’re on the right medication and the proper dosage for you, you may experience a reduction in symptoms, and you may begin to feel better. I hope this helps you find the right medication and dosage that work for you! McDermott M, Ridgway E. Subclinical Hypothyroidism Is Mild Thyroid Failure and Should be Treated. The Journal of Clinical Endocrinology & Metabolism. 2001;86(10):4585-4590. doi:10.1210/jcem.86.10.7959. This study was completed and results were published that there was no significant difference between therapies…I went to the link above and then googled the name of the test, and the article for the study was published already. You said you get hives from Hashi’s. I do too for the last 21 years off and on. Has the Cytomel helped with the hives? My Dr only gives me levothyroxine. Thank you for any info. Cytomel has worked wonders for me. I suffered from sever depression and they were just giving me T4. I found a dr. that worked with me and started giving me T3-Cytomel and the difference was short of a miracle. Becky- I am so happy to hear that you have found a medication that works for you! I look forward to hearing your progress on this page! Thyroid tissue can regenerate, but the rate at which it does is not always predictable. Thus, some are able to stop the autoimmune attack on their thyroid and regain normal thyroid function. Others can reduce the dose of medications, and others will need to stay on the medications indefinitely. I’m currently working on some protocols to help with tissue regeneration. I am not taking any thyroid meds with the LDN as I want to do my tests again in another month just to see where my TPOS are at. Do you have any thoughts as to what I should do as far as adding thyroid meds back in or can LDN be used alone? Nichole – thank you for reaching out. It is never advisable to stop taking your medications, or alter your dosages, without the advice of your practitioner. T4 thyroid hormone medications have a half-life of about 1 week. This means that when a person stops taking them, the amount of the hormone activity in their body, from the medication, will decrease by about 1/2 each week. For T3 medications, this half-life is only about 1 day. Generally, within three weeks (or a few days for T3), most of the hormone will be out of the body. This could result in increased symptoms, an increase in the autoimmune attack on the thyroid, and extra stress on your body and the thyroid. Dr, Izabella, so thankfull for all Your input in thyroid patients, I have never ever get better articles for Hashimoto thyroidytis. Could You please write about OCD, obsessive-compulsive treatment, please! Sandra Thanks for your question! I’ll add this to my list of future article possibilities. I would love to hear more about your experiences here on this page! I got diagnosed with thyroid cancer after I went to the Dr. And was also diagnosed with mono. I am currently taking 225 micro miligrams of synthroid. They just increased me a couple days ago. I had surgery about 7 months ago to remove my whole entire thyroid, however they couldn’t get all of it or all of the cancer so I have to keep what’s left of my thyroid at a stand still so the cancer doesn’t grow either. I chose not to do the radio active iodine pill because I have a 2 year old and would never forgive myself if she got radation poisoning from me. (Cause who can tell their 2 year old you can’t hug or kiss me or sleep with me because I can potentially hurt you). I have one Dr. Telling me my levels are fine and another telling me they are not. I’m pretty sure at this point I can tell when I’m not right! I am still having fatigue, weight gain, my hair is falling out, and my periods are absolutely horrible I have a sensitivity to heat and cold but it’s different everyday.. one day I might be cold no matter how many clothes I have on or how high I blast the heater and other days I can’t she’d enough clothes and sit on the ac long enough. I am desperate to find answers and will do just about anything to fix this. My baby girls asks me everyday to play with her and everyday I have to drag myself onto the floor to play with her. I want to enjoy playing on the floor with her again. I also have a 10 year old who is active in sports I would love when softball season starts up again to enjoy that and not be sweating like a pig in front of all her softball team and all the coaches!!!! Any help would be greatly appreciated. Darcie – thank you for following this page. My heart goes out to you. <3 I highly recommend that you work with a functional medicine clinician to be a part of your own health care team. It’s an entire medical specialty dedicated to finding and treating underlying root causes and prevent serious chronic disease rather than treating individual disease symptoms. Here are a few articles you might find helpful as well. I have been very concerned about Synthroid (or other thyroid medications) causing hair loss. My doctor’s attitude toward my concern was dismissive, as she does not agree that it can cause hair loss. But I have read all over the internet that a side effect of Synthroid is hair loss. I have read many reviews about Synthroid and people say it DOES cause hair loss. It even says it in the information pamphlet that comes from the pharmacy. My TSH is a 4, which is still within “normal” range, but my doctor wants me to start thyroid medication because a TSH of 4 is not ideal for conception (which I’m trying to achieve). I also do have symptoms of hypothyroidism, like hair loss, so I cannot bare the thought of making the hair loss worse. I have been reluctant to start a thyroid medication because I’m afraid it will cause more hair loss than I have already been experiencing. Why do thyroid medications cause hair loss? Are there thyroid medications that are less likely to cause hair loss? If Synthroid does cause hair loss how severe is it and how long does the hair loss typically last? The fear of losing more hair has been extremely stressful for me. I would greatly appreciate any insight into this situation! Michelle – thank you for reaching out. I understand how frustrating this can be. <3 Sometimes, when your TSH is on the outskirts of the normal range, you can continue to lose hair, and your hair may lack luster and shine. If your hair tangles easily, this is a sign that you may not be getting enough thyroid hormone. Talk to your doctor. You should see a change within 4-6 weeks. Consider the type of thyroid medication you are taking. T3, the more active thyroid hormone, is your “beautiful hair” hormone that helps you grow your hair and prevents it from falling out. Synthroid, Levoxyl, and Tirosint only contain T4, the less active hormone. T4 should be converted to T3 in the body…except this doesn’t always happen. Sometimes an addition of Cytomel**may be cross-contaminated with gluten*** (a T3 medication) or a switch to a medication that contains a combination of T3/T4 such as Armour, Nature-Throid or compounded T4/T3 may result in a return of your hair’s luster and shine. There are quite a few options for thyroid medications. In my experience, what works for one person may not work for another. If your doctor will not prescribe the medication which you are looking for, ask your local pharmacist for doctors in your area who prescribe the medication you are looking to try. Have you read these articles? Has anyone experienced head shaking? Jay- I highly recommend that you work with a functional medicine clinician. It’s a whole medical specialty dedicated to finding and treating underlying causes and prevention of serious chronic disease rather than disease symptoms. I too have head shaking, A few years ago my local Neurologist ordered a Cat Scan results was spots on the nerve endings in the brain. Dr. told me it was MS. I got a second opinion and a MRI test then was told the spots on my brain was nerve damage due to a long history of having migraine headaches. But not MS or Parkinson’s Disease. Still I have head shaking, now hand shaking like a caffeine high. Wish I knew the answer too! Linda- I highly recommend that you work with a functional medicine clinician. It’s a whole medical specialty dedicated to finding and treating underlying causes and prevention of serious chronic disease rather than disease symptoms. Yes, I have slight head shaking. I am trying to figure it out. thought I might have early signs of Parkinson. It is freaking me out. I never had this until my thyroid was removed and I started Nature throid. I have only been on it for 6 to 7 weeks. Why is this happening? Sally- Most thyroid conditions result from the immune system attacking the thyroid because the immune system is out of balance. Even when the thyroid is taken out surgically, is ‘dead’, or treated with radioactive iodine the autoimmunity still persists in most cases. Many people will have their thyroids removed, and will develop new autoimmune disorders such as Lupus, Rheumatoid arthritis, etc. The immune system just finds a different target. We need to re-balance the immune system to prevent this (sometimes the autoimmunity can be reversed as well). The gut determines your immune system. With the exception of discussing proper thyroid medication dosing, the majority of my website and my book focuses on balancing the immune system. The info I present is based on my own research and journey for overcoming my autoimmune thyroid condition. 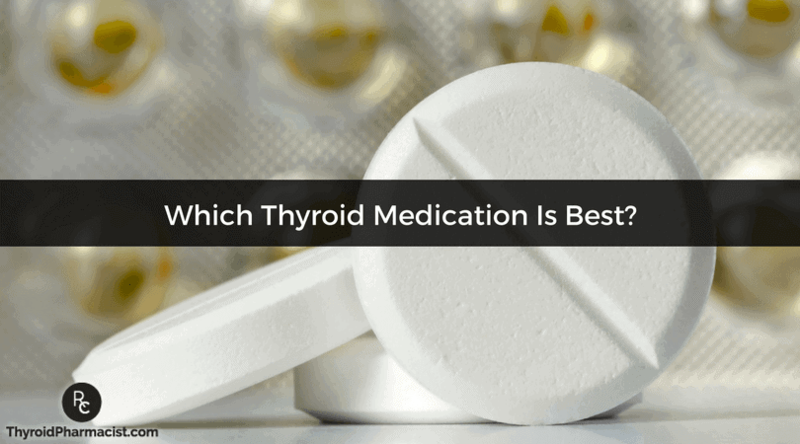 where does thyroxine sit in these groups of thyroid meds. Apologies if I missed it! Allie- There are quite a few options for thyroid medications. In my experience, what works for one person may not work for another. If your doctor will not prescribe the medication you are looking for, ask your local pharmacist for doctors in your area who prescribe the medication you are looking to try. Have you read these articles? On the 12th of Feb I was put on liothyronine 50mcg the piano only change I have notice is I’m constipated and before when I was on synthroid 150 mg I had diarrhea and I was very nerves all the time and had anxiety attacks bad . Evelyn- There are quite a few options for thyroid medications. In my experience, what works for one person may not work for another. If your doctor will not prescribe the medication you are looking for, ask your local pharmacist for doctors in your area who prescribe the medication you are looking to try. Have you read these articles? I had good results cycling up from 7.5 to 75 mcgs of Liothyronine, under the care of my naturopath. No quick results-took a year and a half before feeling optimal. Mimi- Thank you so much for sharing! Thyroid tissue can regenerate, but the rate at which it does is not always predictable. Thus, some are able to stop the autoimmune attack on their thyroid and regain normal thyroid function. Others can reduce the dose of medications, and others will need to stay on the medications indefinitely. I’m currently working on some protocols to help with tissue regeneration. I was diagnosed with Hashimottos two years ago. I had the worst fatigue/low energy ever. I would cry before I had to take a shower or walk to the car, nevermind if I had to really do something! I started taking synthroid per my endocrinologist. I had the worst anxiety attacks ever. I didnt sleep hardly at all for two weeks. she wanted me to try and tuff it out and see if they went away. They didnt, just got worse. I switched over to Thyroid Armour. the anxiety went away. when I was on synthroid my counts were got to be in the “normal range” but I still felt lousy. Although i did have alittle improvement in the lethargy I still was no where near normal feeling. I’m still not and its been over a year. I was seeing my endocrinologist every 3 weeks and after about a year I stopped seeing her too. She wasnt doing a thing for me but giving me meds and drawing blood monthly. I was paying out the nose for her because she didnt take my insurance and it just wasnt worth it. Now Im on my own. she only seemed to care that my counts were good NOT that I still felt LOUSY!! I feel like Im on my own with all of my medical issues, I cant even find a Primary dr that will take me seriously. Its very disheartening! Good Luck everyone! I was unable to take synthroid when my endo demanded that I try it after 10 years of moderate success on Armour. I had to step up the dose every couple of years. Synthroid gave me abdominal pains and anxiety. My supportive PCP suggested adding a nascent iodine supplement. Success! Best numbers since my diagnosis, and I FEEL better, too! I don’t see ERFA on your list of NDT medications. Would you consider a blog post about it? I read your alternatives to conventional t4-only meds. It would be amazing if you were to write an article on homeopathic medicine as a beneficial option as well. Thank you for share of knowledge and existing to help those with Hashimoto’s cope along with a variety of other diseases and conditions. Elise- Thank you so much for sharing! Thyroid tissue can regenerate, but the rate at which it does is not always predictable. Thus, some are able to stop the autoimmune attack on their thyroid and regain normal thyroid function. Others can reduce the dose of medications, and others will need to stay on the medications indefinitely. I’m currently working on some protocols to help with tissue regeneration. Dr. Wentz, my 76 year old mom was recently told that she could not be given over 120 mg of NDT due to her age. Have you heard of this before? Jayne- I can’t make any direct medical recommendations to any single person for legal reasons but Thyroid tissue can regenerate, but the rate at which it does is not always predictable. Thus, some are able to stop the autoimmune attack on their thyroid and regain normal thyroid function. Others can reduce the dose of medications, and others will need to stay on the medications indefinitely. I’m currently working on some protocols to help with tissue regeneration. What should be the proper ratio of T3 to T4? Thanks…. I took NDT for years. In the beginning because my thyroid was slow later I was diagnosed with Hashimoto. I continued taking Erfa, had healthy diet but still felt extremely fatigued and exhausted. My lab test showed perfect TSH but t3 and t4 stayed low. Desperately I switched to synthetic T4 and felt my fatigue disappear from day one. Been on it for 4 weeks now. Really regret not being able to take NDT because I want most natural treatment. Will see how it goes. But never imagined What it would feel like to not being tired any more. Lena- Thyroid tissue can regenerate, but the rate at which it does is not always predictable. Thus, some are able to stop the autoimmune attack on their thyroid and regain normal thyroid function. Others can reduce the dose of medications, and others will need to stay on the medications indefinitely. I’m currently working on some protocols to help with tissue regeneration. Lena can you explain to me what Erfa is? I took took synthroid and even tho my counts were normal I still had terrible fatigue and exhaustion. No energy at all it was awful and switched to Armour and there was some improvement in the fatigue but still no normal but def better. So what is it that helped with your fatigue. altho I was diagnosed two years ago all this is still new to me. I dont know what the Erfa is and still not even sure what Hashimottos is or what it does to my body. I just KNOW I DONT FEEL GOOD> My dr isnt really interested in the fact that I dont feel good. she just is glad my counts are good….. UGH!!! Linda- There are quite a few options for thyroid medications. In my experience, what works for one person may not work for another. If your doctor will not prescribe the medication you are looking for, ask your local pharmacist for doctors in your area who prescribe the medication you are looking to try. Have you read these articles? I’ve been on synthroid for at least 20 yrs. My ins will not cover unless it’s a generic but they don’t seem to work for me. Starting to notice more symptoms the last few mo’s. Hair loss and feel more nervous. Waiting on the results for the most recent bloodwork. Wish there was some thing to try the ins will cover. Jill- Hair loss is a distressing symptom experienced by women with Hashimoto’s. For women, our hair represents our femininity, and losing our hair is a constant reminder that something is off and that we are not well. Have you read these articles? Doesn’t your Ins. Company know that all generic thyroid meds are made over seas and are NOT controlled or measured out properly? I was on generic and because the medicine fluctuated daily my levels were a mess. This caused scar tissue ony throat and thyroid gland. If your doctor demands you to not take generic, Shouldn’t they HAVE to accept it? Kelli- There are quite a few options for thyroid medications. In my experience, what works for one person may not work for another. If your doctor will not prescribe the medication you are looking for, ask your local pharmacist for doctors in your area who prescribe the medication you are looking to try. Have you read these articles? I have had thyroid disease since my 5th baby at 42, first put on armour didn’t work for me, then Lavoxel.sp? Level thyroxine 150 then down 125. I now have lupus and fibromyalgia, and auto amine hepatitis. .weight gain stomach issues nausea joint pain extreme fatigue! ! Miserable I have a neuro. Doc. Rheumatologist, and md. A lot of prescriptions no help! Help!? I have been dealing with Hypo for about 4 years now. I am on 100 mcg of Levothyroxine. All of my blood work comes about normal (TSH of 2.38-) but I am still getting all the symptoms ( fatigue, weight gain, dry skin). I have switched doctors twice and they all keep saying that my labs are normal and there’re is nothing they can do. How do I find a doctor that is open to looking at different medication? I was referred to an Endo but he was no help either. I live in Long Beach, Ca. If anyone could recommend where I can go to get better help, please let me know. If you are looking for someone to provide different meds. Ask you pharmacist for a list of Dr.’s in your area that prescribe that med, than call or look up which one’s your insurance will cover. This is a good start. Listen to the Thyroid summits, just google it.. See a Functional medicine doctor or a naturopath. Go gluten, dairy and sugar free for 2 weeks to see if you feel better. Make sure your adrenals are in check or take adrenal support and maca, fish oils and probiotics. Get a panel of blood tests that a western medicine doctor doesn’t typically do to get to the root cause. Gerlinda- Thank you so much for sharing! Thyroid tissue can regenerate, but the rate at which it does is not always predictable. Thus, some are able to stop the autoimmune attack on their thyroid and regain normal thyroid function. Others can reduce the dose of medications, and others will need to stay on the medications indefinitely. I’m currently working on some protocols to help with tissue regeneration. I have hashimotos. My TSH, T3 and T4 labs are in the normal range. A new endo today prescribed Synthroid (and said to ignore dietary and supplement recommendations from your book and just eat fresh food (gluten and dairy included)). I am so confused if I should take it the synthroid. Suburban- Most conventional physicians use the TSH test to determine if one has a thyroid disorder and to dose thyroid medications. Anna I see dr.mark stolar of northwestern. I feel I’m in great hands with him. He has helped me feel better in only one month. Check him out. Patricia Scott, I know just how you feel! You have described me to a tee in your post! I have been on synthroid for over 25 years and feel worst than I ever did! So friggin frustrating.. Anyone with any autoimmune condition should eliminate bad gluten (wheat, barley, and rye). You mention you have several autoimmune conditions. Sounds like it’s time for you to take your healthcare into your hands, and not just except everything an MD says. I eliminated bad gluten 5 yrs and my health improved so greatly. My neurologic issues and fibromyalgia have decreased so much that I practically have had no symptoms since my GF healing process started. Many other conditions have reversed as well. Note, that most physicians (unless they make a point to) aren’t very educated regarding nutrition, much less gluten intolerance or celiac disease and the over 300 conditions that gluten consumption can cause over time. Just something to know and consider. Good luck! Dawn- Most people will see a dramatic reduction in gut symptoms, brain symptoms, skin breakouts and pain by eliminating the foods they are sensitive to. Some will also see a significant reduction in thyroid antibodies! An additional subset of people, will actually be able to get their Hashimoto’s into complete remission just by getting off the foods they react to, normalizing their thyroid antibodies, and some even normalizing their thyroid function! Here are a couple of articles you may find helpful. Patricia, If you get this twice, sorry. I hit the wrong key and lost what I had written. Since 1965, I have taken Synthroid (Levothyroxine) in various doses. About 10 years ago, Cytomel (Liothyronine) was added. I started feeling great. About 3 years ago, my T-3, T-4, TSH readings became out of balance, and my doctor tried many adjustments. I even ended up at a cardiologists, but, by the time of my appointment, the discontinued Cytomel was added back to my treatment. I felt great and had no heart issues after taking the combination of Cytomel and Synthroid. Then, my new doctor wanted me to try Armour. After one month, I was feeling badly again. So—–Cytomel and Synthroid in combination for me from now on. Have you had a breast implant? If so, read Dr. Susan Kolb’s THE NAKED TRUTH ABOUT BREAST IMPLANTS. Symptoms you describe are discussed in this book. Good luck. Jen- Thyroid tissue can regenerate, but the rate at which it does is not always predictable. Thus, some are able to stop the autoimmune attack on their thyroid and regain normal thyroid function. Others can reduce the dose of medications, and others will need to stay on the medications indefinitely. I’m currently working on some protocols to help with tissue regeneration. YOU, my friend, are speaking my language… Except for the dairy part. That would be so hard for me. Do you take medicine? Dr says my levels are low but I feel great since changing my lifestyle about six weeks ago. I do not want to get on medicine…at all. Ashley- Most people will see a dramatic reduction in gut symptoms, brain symptoms, skin breakouts and pain by eliminating the foods they are sensitive to. Some will also see a significant reduction in thyroid antibodies! An additional subset of people, will actually be able to get their Hashimoto’s into complete remission just by getting off the foods they react to, normalizing their thyroid antibodies, and some even normalizing their thyroid function! Here are a couple of articles you may find helpful. Hello! Looking for a great Endo Dr.in the LA area? I went gluten free and it made a bit of a difference on my antibodies. I had to go grain free to get my antibodies under the lab reference range. Just going gluten free isn’t enough for a lot of us. You must also give up grains (corn, rice, etc.). Thresa- Did you know that reactive foods trigger an inflammatory response in the GI tract, leading to malabsorption of nutrients (gluten sensitivity in particular has been implicated in causing a Selenium deficiency, a well known risk factor for Hashimoto’s), and can also produce intestinal permeability whenever they are eaten? Had total thyroidectomy about 5 years ago. Family doctor does my primary care. I am on 150 synthroid and right after surgery I felt alright, a friend of mine told me about cytomel and that was added to my meds. I was feeling good. After doctor visit, inc. blood work, doctor lowered my dose to 125. I gradually became more and more tired. I discovered my pharmacyst had started giving me generic synthroid. I opted to return to synthroid non-generic, this seems to work somewhat better, but still need more energy to function fully. Your site has given me more knowledge and I need to know am I crazy or do all doctors believe numbers over patient observations? Would appreciate your input. Barbara- Most thyroid conditions result from the immune system attacking the thyroid because the immune system is out of balance. Even when the thyroid is taken out surgically, is ‘dead’, or treated with radioactive iodine the autoimmunity still persists in most cases. Many people will have their thyroids removed, and will develop new autoimmune disorders such as Lupus, Rheumatoid arthritis, etc. The immune system just finds a different target. We need to re-balance the immune system to prevent this (sometimes the autoimmunity can be reversed as well). The gut determines your immune system. With the exception of discussing proper thyroid medication dosing, the majority of my website and my book focuses on balancing the immune system. The info I present is based on my own research and journey for overcoming my autoimmune thyroid condition. Christine – There are quite a few options for thyroid medications. In my experience, what works for one person may not work for another. If your doctor will not prescribe the medication you are looking for, ask your local pharmacist for doctors in your area who prescribe the medication you are looking to try. Have you read these articles? 1. I was wondering what you think of having T3 slow release twice a day with the half life? i.e. I’m on 30mcg of slow release T3 twice a day 12 hours apart. Does that mean I’m having 30 or 60? Pharmacists seem to have differing opinions this. Are you a fan of having slow release once a day or twice a day? 2. I’m only on T3 and not on any T4 – my T4 is below the reference range (because of this) – is this an issue? Do I need to be on T4? I’m doing that because I’m weary of reverse t3 which I’ve had before. Karen – Thank you for following this page. Please, understand that due to liability issues, I am unable to answer specific medical questions. Jennifer – you don’t necessarily have to have antibodies to have Hashimoto’s. About 10% will be diagnosed through an ultrasound. It generally signals a less aggressive form of Hashimoto’s. You can also catch Hashimoto’s in the early stages. Here are the tests you need for diagnosis. Most endocrinologists don’t run them all so you will have to request them. It’s possible that your results were just within the accepted range at the time of the test. Make sure to request a copy of your labs as well. Weight gain and difficulty losing weight is a feature of Hashimoto’s. Some report more weight loss with T4/T3 combinations (Armour, Nature-Throid, compounded medications) versus T4 medications (Synthroid, Levoxyl, Tirosint) alone. T4 is a precursor to T3, but some individuals do not convert T4 to T3 properly, and the T3 component is the metabolically active one. Natali – thank you for following this page. Hi , I’ve been on medication for 16 years I take Euthyrox 150 mg on daily bases ,I have high palpitation and can’t lose weight, I live in Jordan in the Middle East and no one ever mentioned that I might need Zinc or another type of medication, and if anyone can help to know from where to buy organic thyroxine. Paula – thank you so much for following this page. Hi Kathy, did something helped with your daughter’s dry eyes? Hi, I have two daughters, one has TPO antibodies (2001), and the other both antibodies (TPO and Thyroidglobin) (2007). Until recently, I had good check ups for thyroid. My youngest girl, the specialists and primary never ran a TSH or T4, while her older sister was found hypothyroid with just a few over for the TPO antibody. As a result, my youngest daughter had to go full blown autoimmune hypothyroid with literally hundreds of both antibodies (2007)! And, the same specialist that ignored her while she made visits with her sister to get T4 (levo.) check ups, still sees both girls. I would like both to see my family doctor to get natural T3 prescribed, as I have done the opposite of what their endo wanted, tested each for FT3 (both have about 8%, scraping the bottom of the bowl in FT3). Both are vividly besides themselves as their endo. has recommended that each may have a life threatening issue with trace amounts of iodine in natural thyroid hormone replacement. He has never tested T3 nor any other cofactor(s), and he deploys my helping with changing their diet to paleo, LCHF. I would feel terrible if after they may attempt to get natural thyroid replacement T3/T4 and then, that trace amount of iodine caused a coma or something, that their endo has implanted that nightmare in them for about 10 to 17 years. I don’t know about any reason why the girls would not do nicely on T3/T4, why the endo says has no testing or other science behind his discussions. I’ve attended your webinars and found all of them so inspirational, and your interviewing on them has help me to continue to try to get the needed T3 for each daughter. I am taking NatureThroid 1.5 grains, for hypothyroidism and trying to go from 8% FT3 to over 75% (starting 3 months ago). Is there any reason not to seek T3 treatment for my daughters? How might I try to override those pieces of bad advice to assure them that T3 is important to mental health also, and overall well being? It seems to me that nobody should be given levothyroxine as the drug of first choice, for one compelling reason: There are patients who don’t convert T4 to T3 adequately enough to get a tissue level response, resolve hypothyroid symptoms and prevent future diseases that spawn from low thyroid function. Adequate conversion must be determined prior to thyroid hormone therapy with a T4 only drug. It’s no different than when a patient goes in to his or her doctor with an infection. The doctor will use the lab to determine what type of bacteria (assuming it’s not a viral infection) and based on the lab report, will prescribe an antibiotic most appropriate (and one that the patient isn’t allergic to) that has the best chance of killing the bacteria. Yet many doctors just assume that conversion will ALWAYS take place (why the sudden loss of common sense?) and prescribe synthroid. When are pharmacists going to be put back in charge of drug therapy? I propose that a law be created making pharmacists thyroid screening specialists. We would be able to do a far more effective job towards educating the public about hypothyroidism, not to mention determining those who are being treated for chronic pain with narcotics (an epidemic), when they should be receiving a T4/T3 or T3-only medication because of an underlying thyroid illness. In the meantime, I’m going to continue to develop tracking software for thyroid patients so they can document their treatment strategy. Jeff – thank you for following this page and for the feedback. I highly recommend that you work with a functional medicine clinician. It’s a whole medical specialty dedicated to finding and treating underlying causes and prevention of serious chronic disease rather than disease symptoms. Do patients generally report feeling better on a timed release cytomel or on the non timed release? I take synthroid and would like to add t3 at the smallest dose. What are patients reporting to you? I’ve been on Nature Throid since May 2013 and have done pretty well on it. The only issue I’ve had is heart palpitations, but I believe it’s from low iron and ferritin. My endocrinologist will give me Nature Throid, but prefers synthroid as does my new primary doctor. My new primary doctor is considering taking me off of it or just putting me on synthroid. My endocrinologist didn’t like the idea of me going off of it. He suggested trying Synthroid for 2 weeks and I don’t know what to expect. I’m still taking Nature Throid. I’m reluctant to try synthroid. I’m hypothyroid and have hashimotos as well. Is 2 weeks enough? Is it possible I’ll feel worse? He gave me a dose above what I’m on now. Susan – thank you for following this page. If you have been prescribed thyroid replacement hormone but your thyroid levels are still not optimal and your doctor is convinced that Synthroid® (which is a T4 only hormone replacement) is the only replacement that you should try, remember, information is power! In order to self-advocate, it’s important to understand the ins and outs of thyroid medications. There are many reasons why your thyroid levels might not be optimal and my Optimizing Thyroid Medications eBook will give you those answers as well as give you a full explanation of the different options that are available to you! I want you to be empowered, so I’m giving this eBook away as a FREE download this week! Download it for FREE Optimizing Thyroid Medications eBook! I was taking Ritalin ( then Concerta) prior to my Hashimotos and hypothyroidism diagnosis Would stimulant medication for the year prior to the diagnosis be the thing that could have triggered it? Heat – thank you for following this page. I wish I could give you more direct advice. I would advise you to ask your personal pharmacist or a trusted clinician who’s care you are under. I am not able to respond directly to these types of questions here. Here are some articles you may find interesting. Im from paris, france, and here enco are totally out of date, you have no idea. The only NDT i was able to find here is “thyroid glandular ‘ by american biologics. How much would “replace” 25 ug levo? What is the conversion between thyroid beef powder and sythetic levo? Eva – Thank you for following this page. Please, understand that due to liability issues, I am unable to answer specific medical questions, but I highly recommend that you work with a functional medicine clinician. It’s an entire medical specialty dedicated to finding and treating underlying causes and prevention of serious chronic disease rather than disease symptoms. I’ve just red your second book about Hashimoto (I am very grateful for it and for your work) and I introduced suggested by you diet and supplementation. I’ve 2 question. First one regarding selenium. I’m taking right now 200 mg of it. How long shod I take it and when and how much I should reduce the dose of it? And second one about cocoa – is it good to eat it or better not. I have a question that I can’t seem to find answers to. I have subclinical hypothyroidism (TSH 2.67-3.3, FT4 1.0-1.3, FT3 2.4-2.8). I have absolutely no typical hypothyroid symptoms. I had a miscarriage a few months back and since have gone on Armour (30mg /day). I got my labs checked at 6 weeks and my TSH is 2.8 (3.3 6 weeks ago) with my FT4 at .85. I am very concerned about my T4 dropping so significantly, as it was 1.3 six weeks ago. My doctor says that is it fine but I am concerned because I am going to try to conceive soon. I want to make sure my labs are in the normal range. I know my TSH needs to get down closer to 2. I am wondering if I need a different medication or if I need to up my dose? I know that you can’t give me recommendations on my specific labs, but I would like to know if I should be concerned about my T4 levels, and if my TSH is dropping fast enough. Should I try to find another doctor who will look deeper at this? I had been taking Levoxythyrine for years when my doctor at the time recommended trying Naturethroid. I loved it, mainly because I lost 15 lbs. in 6 months and felt less sluggish. My current doctor does not recommend Naturethroid in general and has had me back on Levoxythyrine for 5 years. The weight has returned and I am sleeping too much. I am 68 and have no heart issues other than a slight heart murmur. Should I consult an endocrinologist? Marilyn – thank you for reaching out. I am sorry to hear your are struggling. There are quite a few options for thyroid medications. In my experience, what works for one person may not work for another. If your doctor will not prescribe the medication which you are looking for, ask your local pharmacist for doctors in your area who prescribe the medication you are looking to try. Have you read these articles? Hi. Thanks for this article. I was on sythroid and cytomel for about 18 years, but switched to compounded about a year ago and have been doing well (along with supplements, dietary changes and lots of self care). The problem is I’ve recently been told I can no longer get the compounded thyroid medication due to a “distributor problem”. I’m so scared to make a switch again – it took me close to a year to adjust and feel better. Any thoughts or suggestions? Anyone else having this problem? I was on Armour years ago and I suppose I could try that again, but I’m so upset that the I can’t get the compounded medication anymore. I’m so grateful for any thoughts. Karen – thank you for reaching out and sharing! I am sorry to hear you are have problems getting you medications. I understand how frustrating it can be. <3 There are quite a few options for thyroid medications. In my experience, what works for one person may not work for another. Have you read these articles? I am being treated by a functional medical dr. currently. My TSH had been 4.7 and is now hovering around 3.7. I am 54 years old and going through a terrible menopause transition. Before I saw the holistic dr, I went to an endocrinologist. First I was on generic levothyroxine and suffered a red face, acne and blurry vision w/sensitivity to sunlight on the lowest dose. Once it cleared up, I tried the same smallest dose of Synthroid and again the bright red face but not the eye issues. The holistic dr. has now placed me on the lowest dose of Armour. I’ve only been taking 6 days so far, and starting to see the sensitivity to sunlight and perhaps slight reddened face. My dr. is concnered if I react to Armour, she isn’t sure what would I do to treat from here if I am one of those people who has a rare reaction to levothryoxine. What other ways to treat hypothryoidism exist, if any, if someone is unable to tolerate levothryoxine in any form? We talked about tyrosint which I can’t take since it is very expensive and I cannot take capsules as those give me severe gastritis. Ideas? I do NOT suffer Hashimotos, but I do have estrogen dominance with a progesterone deficiency. ED is assumed to be the cause of the thryoid dysfunction. We were working on the thryoid, the nutritional deficiencies, and getting the toxins out first before attempting to try natural progesterone to address my ED, since I tend to suffer reactions and I need to treat in different phases in case of a reaction, which will help to understand what I am reacting to. I apologize for the long question…I just wanted to know, if I fail on the Armour thryoid, is it at all possible to bypass the levothryoxine and treat subclinical hypothryoidism another way? I am highly symtpomatic with hair loss and thinning, excess fat gain around the middle, terribly sagging skin on the arms and inner thighs – all of which has been blamed on my estrogen being high and progeterone deficiency, yet since T3 and T4 are so low, it is likely a contributor. Thanks for your wonderful articles! Through your help I’ve been able to find this holistic dr and also discovered Magdalena Wszelaki whose blog I also follow. April – thank you for reaching out and sharing your journey! <3 There are three types of medications that can be used to treat underactive thyroid: T4 containing medications (include Synthroid, Levoxyl, Levothyroxine and Tirosint), T3 containing medications (Cytomel and compounded T3) and combination T4/T3 medications (Armour, Nature-Throid, WP Thyroid, compounded T4/T3 medications). Some people with Hashimoto’s, may not be able to properly convert levothyroxine (T4), the active ingredient in Synthroid, to liothyronine (T3), the more metabolically active thyroid hormone, leading to unresolved thyroid symptoms, including fatigue, depression, weight gain and hair loss, despite being on medications. Hashimoto's is definitely not an easy path. But I have learned so much, not just information on healing, but I've learned about myself, how to rest and put myself first. I do hope you continue to experience healing on your journey <3 Have I shared my Optimizing Thyroid Medications eBook with you yet? I hope you enjoy it! I was on synthroid for over 10 years and it did NOTHING for me. My family doctor sent me to endocrinologists, who looked at my tsh level and said I was fine and walked out. They are useless. I did research and talked to my dr and she prescribed dedicated pig hormone, and though still not right, my nails no longer crack towards the quick and my skin is less dry. I am also less constipated, but I still lose hair (haven’t shaved my legs or pits in 30 years), have very short eyebrows and more. My dr does whatever I ask her to. My thyroid gland was surgically removed in 2003. I have been on meds since then. I have also had an itchy rash on my neck and upper back. I take 150 mg generic synthroid each day. Could the rash be caused by my meds? I am now 76 years old and do not have an abundance of energy, and I find it impossible to lose weight. Marilyn – thank you for reaching out and sharing your journey. I understand how hard this can be. <3 There are three types of medications that can be used to treat underactive thyroid: T4 containing medications (include Synthroid, Levoxyl, Levothyroxine and Tirosint), T3 containing medications (Cytomel and compounded T3) and combination T4/T3 medications (Armour, Nature-Throid, WP Thyroid, compounded T4/T3 medications). Some people with Hashimoto’s, may not be able to properly convert levothyroxine (T4), the active ingredient in Synthroid, to liothyronine (T3), the more metabolically active thyroid hormone, leading to unresolved thyroid symptoms, including fatigue, depression, weight gain and hair loss, despite being on medications. Please if you can comment on those of us with Hashimoto’s and Graves who take Methimazole – ok to take it long term, have thyroid removed or what other options? Tana – thank you for reaching out. I understand how overwhelming this can be. Graves and Hashimoto’s are both autoimmune conditions that affect the thyroid. They are thought to be closely related. Sometimes one turns into the other. The difference is the site of the antibody attack. In Hashimoto’s, the antibodies are found to thyroglobulin (in 80%) and thyroid peroxidase (TPO) enzyme (in 95% of people) Hashimoto’s results in hypothyroidism and is usually treated with Synthroid and replacement hormone. My immune system is okay. I don’t have Hashimoto’s. My antibodies are quite low. My diet, supps, approach to removing toxins, etc are optimized now. These aren’t the reason for my subclinical hypothryoidism. I’ve tried three different kinds of levothryoxine based meds – two synthetic ones and Armour, and I react the same way with a bright red face and acne. With these unmanageable symptoms, I am going to forget about treating my thyroid with levothryoxine now, though my TSH is 3.7 and sometimes higher, and my T3 is 2.2. T4 is also pretty lower but slightly higher lately. The cause of my thryoid issues is thought to be estrogen dominance. I am now working with a functional medical practitioner. Do you think it makes more sense to focus on tackling the root cause, which we are attempting to do by reducing estrogen and increasing progesterone, to achieve the hormonal balance I need to improve my thyroid function, rather than continue to try to treat my thyroid and deal with yet more issues from side effects? I might be willing to try a very low dose of T3 if my dr. thinks its suitable for me, but how does that impact T4 and TSH? Amy – thank you for reaching out. I am so sorry to hear you are struggling. I do understand how frustrating it can be. When it comes to weight gain these are a few things to think about. Hi! So grateful to have a knowledgeable person available to answer my questions! I was diagnosed with Hashimoto’s and had a complete thyroidectomy due to thyroid cancer twenty years ago. Because of the thyroidectomy, do I still have Hashimotos? I have always thought that because my thyroid was removed, that meant that I no longer had Hashimotos, but I was told by a doctor that the removal of my thyroid did not relieve me of Hashimoto’s disease. What is accurate? Also, I have been on Levothyroxine and lately, although my TSH levels look normal, I don’t feel normal, low energy, hair loss, and have weight gain and an extremely hard time losing weight. Would I benefit from Armour? I am looking for a physician in LaCrosse, WI area who can help me feel human again. I’ve suffered for several years with extreme fatigue, depression, and most all other hypothyroid/hoshimotos symptoms but no one will change me from levothyroxin. TSH is the gold standard they all tell me and just want me to increase my antidepressant. I know something isn’t right and no one will listen. I’m willing to travel 100 miles to find the right physician for me. Can you help please? Alice – thank you for reaching out and sharing your journey with me. I understand how hard it can be to find a practitioner. K3 highly recommend that you work with a functional medicine clinician to be a part of your own health care team. It’s an entire medical specialty dedicated to finding and treating underlying root causes and prevent serious chronic disease rather than treating individual disease symptoms. I believe that everyone needs to find a practitioner that will let him/her be a part of the healthcare team. You want someone that can guide you, that will also listen to you and your concerns. You want someone that’s open to thinking outside of the box and who understands that you may not fit in with the standard of care. It’s a good idea to ask some standard questions when contacting a new doctor for the first time. Something else to consider is you can work with a functional doctor remotely, via Skype. You could also contact your local pharmacist or compounding pharmacy, who may be able to point you to a local doctor who has a natural functional approach. But I encourage you to keep looking for the right one for you! Here are some resources you might find helpful. I have an autoimmun condition and a thyreoiditis aswell. For the autoiummun problems I am getting Medrol (methylprednisolon) 4 mg/day. The thyroid condition was considered by an endocrinologist as clinical hypothyreosis and ordered T4 – 13 mcg/day. My main problem is the extreme fatigue is not corrected by therapies listed above. None of the treatments listed above corrected the elevated anti TPO and anti Tg levels aswell. To correct tiredness, my endocronologist advised to take DHEA 25 mg/day. Although it was very helpful for the tiredness (arousal, concentration, mood, etc. ), it created an enormously increased appetite and increased body weight (15 kg in 2 months). My question is: how to reduce extreme tiredness and optimalize the endocrine condition? I have type 1 diabetes mellitus, hashimoto, insulin resistance, IBS, seborrheic dermatitis (on the scalp, eyebrows, face, neck) and I have no idea what to do. Dermatologist prescribed salicylic acid with piroctone olamine, ketoconazole and desonide, but I’m afraid to use them. I’m doing autoimmune diet (but still eating rice, tomato, sugar and much fructose) and I’m worried about my weight, I’m losing a lot. And about hypoglycemia, I don’t know what to eat in these episodes. I’m very anxious and depressed. Sometimes I think I’m losing my mind. For 2 months I used t3 + t4 (handled in a single capsule) in the morning and t3 before bed, and my thyroid tests decreased, I have all symptoms of hypothyroidism! I do not think my doctor did the right calculation. I’ve been seeing several doctors and I do not get better at all! I bought your books and thought about starting the liver protocol. Is there anything else I can do besides the treatments of your book? Camilla – thank you for reaching out and sharing your journey. I am so sorry you have had to go through this. Oftentimes patients will have additional autoimmune conditions. Most autoimmune conditions have common root causes, and a lot of times the things that are recommended for one autoimmune condition will help with others. Conditions that I have found to respond really well to the Hashimoto’s protocols have been rheumatoid arthritis, lupus, Celiac disease, irritable bowel syndrome, eczema, asthma, Graves’, premature ovarian failure, psoriasis, Alopecia Areata, and Sjogrens. I have also seen the protocols help with Fibromyalgia, chronic fatigue syndrome, PCOS, as well as Type 2 diabetes, Crohn’s, and Ulcerative colitis. Is it possible that someone can’t tolerate natural desiccated thyroid? I am currently on armour but struggling with vocal tremors. I have hashimotos as well. My tsh is .37 I’m extremly tired, struggling with weight gain and hair thinning. My eyes feel dry and gritty. I’m not sure what to think. I have tried naturethroid and WP thyroid as well. The vocal tremor is the most troublesome of all my symptoms and I can’t help but think it’s related. Giselle – thank you for reaching out and sharing your journey. There are quite a few options for thyroid medications. In my experience, what works for one person may not work for another. If your doctor will not prescribe the medication which you are looking for, ask your local pharmacist for doctors in your area who prescribe the medication you are looking to try. Have you read these articles? Hi Giselle , did you find something that helped with the dry eyes? I entered my email address as directed to receive the free download copy of the ebook Optimizing Your Thyroid Medication and I never got it just links to 3 other publications that I’m not interested in. I have heard Nature-Thyroid has changed its formula. Is it the same as Natural Thyroid extract (which I am on) or is it just timely from my body to feel run down? I have been slowly introducing more organic fruit and veg into my diet and filtered water for the house and an extra water filter for the drinking water, organic Inika makeup (don’t wear it very often), and chemical free shampoo/conditioner body products (very minimum) and also adding gut healing SB5B (which has been amazing!). Since all the ‘positive’? changes my body is feeling more hypothyroid and anxious than it has in a long time (I think I was feeling better balanced previous to all these new changes). Thank you for your time Dr. Izabella and team! Denise – thank you for reaching out and sharing your journey. I am sorry to hear you are feeling “confuzled”! I am so happy to hear you are taking charge of your health and making some lifestyle changes. <3 There are quite a few options for thyroid medications. In my experience, what works for one person may not work for another. If your doctor will not prescribe the medication which you are looking for, ask your local pharmacist for doctors in your area who prescribe the medication you are looking to try. Have you read these articles? Honestly, there is no one thyroid medication that works for everyone. Armour Thyroid works for me. Different cases need different medications. There’s many factors that play into which medication works for someone. It has to be individualized to that person’s needs. Some people can’t convert thyroid hormone. I happened to be one of those, so I needed a T3 supplement. My endocrinologist suggested Armour because he’s seen it work for many of his patients. So I pay for Armour out of pocket because insurance policies don’t cover desiccated thyroid supplements, even prescribed ones. But just because insurers think it’s outdated doesn’t mean anything; it still works for hypothyroid patients that can’t convert levothyroxine. OptumRx is a Giant Pharmacy Benefit Manager (PGM) is taking over the US Health plans and medicare. They push there services include administration of the Retail Pharmacy Program and the Mail Service Program. 1. Prior Authorization – Your doctor is required to provide additional information to determine coverage. 2. Step Therapy – Trial of lower cost medication(s) is required before a higher-cost medication is covered. or in a specific time period. WP Thyroid or Nature-Throid are hard to find for some time. I prefer a natural thyroid hormone. I recently heard about NP Thyroid from porcine thyroid glandular. What do you think of NP Thyroid as generic brand? Are there any other Natural thyroid hormone that are currently available because WP Thyroid or Nature-Throid and NP Thyroid? Jane – thank you for sharing. I am so sorry that you are having these issues obtaining your medications. <3 There are quite a few options for thyroid medications. In my experience, what works for one person may not work for another. If your doctor will not prescribe the medication which you are looking for, ask your local pharmacist for doctors in your area who prescribe the medication you are looking to try. Have you read these articles? Delinda – thank you for reaching out. I understand how frustrating this can be. I highly recommend that you work with a functional medicine clinician to be a part of your own health care team. It’s an entire medical specialty dedicated to finding and treating underlying root causes and prevent serious chronic disease rather than treating individual disease symptoms. I believe that everyone needs to find a practitioner that will let him/her be a part of the healthcare team. You want someone that can guide you, that will also listen to you and your concerns. You want someone that’s open to thinking outside of the box and who understands that you may not fit in with the standard of care. It’s a good idea to ask some standard questions when contacting a new doctor for the first time. Something else to consider is you can work with a functional doctor remotely, via Skype. You could also contact your local pharmacist or compounding pharmacy, who may be able to point you to a local doctor who has a natural functional approach. But I encourage you to keep looking for the right one for you! Here are some resources you might find helpful. Hello! I was diagnosed with Hashimoto’s 3 years ago. My TSH was 98!!! I was put on Synthroid and then added cytomel. Was ok for a little while and all of a sudden started having panic attacks and racing heart. My endo switched me to Armour thyroid. While on Armour my TSH went up to 26. She would increase my dose but my TSH wouldn’t go below 10. I don’t think my body liked the natural hormone. It also gave me horrible cystic acne and I gained about 15lbs in 3 months. So now I am on Levoxyl only and my TSH came down to .44!! My question is has anyone had success with synthetic hormone? I’m starting to feel discouraged I have read lots of articles and people saying they only had success from Armour. I desperately need to lose this baby weight! Bri – thank you for reaching out. I understand how hard this can be. There are quite a few options for thyroid medications. In my experience, what works for one person may not work for another. When it comes to weight gain these are a few things to think about. Here are some resources I hope you find helpful. Hello I am a functional medicine patient and back in 2016 been dx Hashimotos and now 2018/2019 my sodium drop and was in the hospital and could not fine the cause but found I had a nodule on my thyroid and did a biopsy and schedule for surgery 2/6 for a total removal of thyroid. I was told they put me on synthroid and I do not want it and want to stay on ARMOR. WHICH IS BETTER SYNTHROID OR ARMOR? Marc – thank you for reaching out. I am so sorry to hear you are going through all of this. <3 Nodules and goiters are often the result of toxicity and/or the autoimmune process. So, doing interventions to reduce the autoimmune attack on the thyroid, and toxicity, can be helpful to reduce them. There are quite a few options for thyroid medications. In my experience, what works for one person may not work for another. If your doctor will not prescribe the medication which you are looking for, ask your local pharmacist for doctors in your area who prescribe the medication you are looking to try. Have you read these articles? Most thyroid conditions result from the immune system attacking the thyroid because the immune system is out of balance. Whether you have all, part or no thyroid, the autoimmunity still persists in most cases. We need to re-balance the immune system which begins in the gut. With the exception of discussing proper thyroid medication dosing, the majority of my website and book’s focuse on balancing the immune system. The info I present is based on my own research on my journey overcoming autoimmune thyroid condition. Hashimoto’s is a complicated condition with many layers that need to be unraveled. While conventional medicine only looks at each body system as a separate category and is only concerned with the thyroid’s ability to produce thyroid hormone, Hashimoto’s is more than just hypothyroidism, it’s an autoimmune disease that needs to be managed. I had been on levothyroxine 25mcg when I was first diagnosed with hypothyroidism when I was 14, but after my last pregnancy my doctor said I no longer needed the medicine so I stopped taking it. My weight was 125 while taking it for multiple years, but went up to 145 after pregnancy-off the medication. I just recently pushed my doctor to test for hashimoto’s and they prescribed me 25mcg again. Is a low dose like that likely to cause weight gain? It’s been over 2 years since I’ve been off of it and my TSH it around 8-9. Afraid to take it because I’m worried about weight gain. Madison – thank you for reaching out. I understand how hard this can be. There are quite a few options for thyroid medications. In my experience, what works for one person may not work for another. When it comes to weight gain these are a few things to think about. Is there a desiccated thyroid med that isn’t derived from pork? I would like to try that but am Seventh Day Adventist and we don’t eat pork. Vicki – thank you for reaching out. Yes there are. There are quite a few options for thyroid medications. In my experience, what works for one person may not work for another. If your doctor will not prescribe the medication which you are looking for, ask your local pharmacist for doctors in your area who prescribe the medication you are looking to try. Have you read these articles? Jennifer – thank you so much for sharing. I believe that everyone needs to find a practitioner that will let him/her be a part of the healthcare team. You want someone that can guide you, that will also listen to you and your concerns. You want someone that’s open to thinking outside of the box and who understands that you may not fit in with the standard of care. It’s a good idea to ask some standard questions when contacting a new doctor for the first time. Something else to consider is you can work with a functional doctor remotely, via Skype. You could also contact your local pharmacist or compounding pharmacy, who may be able to point you to a local doctor who has a natural functional approach. But I encourage you to keep looking for the right one for you! Here are some resources you might find helpful. I was wondering about the connection between cholesterol and thyroid issues and meds. My cholesterol has been creeping up for years, however not on statins due to good ratio. Usually over 230 total cholesterol. A few years ago, I got a bad batch of generic levo. It apparently had way too much medication in it, as my hair started to fall out and was very anxious to the point of sitting at the kitchen table and crying for what seemed like hours. I have been since switched to Synthroid. Looking back on blood tests, I noticed that during the episode of bad levo, my cholesterol was under 200 for the first time in years. I never made the connection before, but noticed on the last few thyroid panels, that I might not be converting T4 to T3 very well, although this was never discussed by my endo. A higher dose of Synthroid, just makes me a nervous wreck, but it seems to bring my total cholesterol down. Fearing statins will be an ultimatum soon unless I can talk my endo into T3 meds. Just wondering about the connection between cholesterol and thyroid meds? Jane – thank you for reaching out. I am so sorry to hear you are struggling with this. <3 Elevated levels of cholesterol can be related to adrenal fatigue due to the body compensating for the increased need for this hormone-building material. I highly recommend that you work with a functional medicine clinician. It’s an entire medical specialty dedicated to finding and treating underlying causes and prevention of serious chronic disease rather than disease symptoms. Here are some resource you might find helpful.